Meet the artists showcasing their work for 2018-19 Night Lights! Posted on September 20, 2018 at 6:51 pm. Night Lights, RACC’s outdoor public art event series, is back for five months with local artists/collectives projecting their digital media works onto RACC’s building for several hours starting at dusk. Now in its fourth year, Night Lights is a unique event series that celebrates and highlights the intersections of digital technology, art, and place. 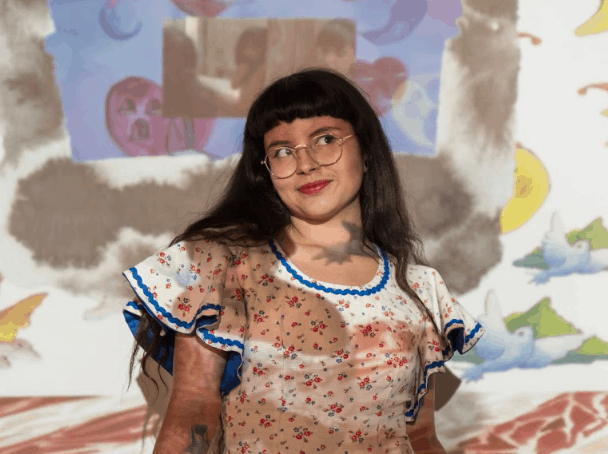 Laura Medina, the first artist to kick off Night Lights on October 4th this year, will be presenting work that bodies the exact intersections Night Lights aims to celebrate. Medina’s projected work, titled Flying, will use different animation methods to convey movement and change of setting to discuss migration as a human right. The location of the projection, as Medina notes, is across the street from Pacific Northwest College of Art (PNCA), formerly a US Citizenship and Immigration Services and US Immigration and Customs Enforcement building. For Medina, we cannot ignore the proximity of the projection to what used to be a distinctly hostile environment, and re-contextualizing this space into an environment that fosters and nourishes acts of solidarity is key. Following Medina, Roesing Ape and Beth Whelan will show their work on November 1st. Titled Windows 11, their work involves a minimalist dance piece inside an architectural projection of the building itself. This interactive piece will use both prerecorded and live dance. Still image from Laura Medina’s work, Flying. 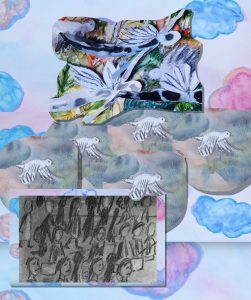 Laura Camila Medina is an interdisciplinary artist born in Bogota, Colombia and raised in Orlando, Florida. She bases her practice around uprooting and migration as a response to personal, cultural, and historical research. Medina is constantly inspired by her memories of home, her mother’s arepas, and her father’s soundtracks. Her work has shown at the Center for Contemporary Art & Culture, PLANETA New York, and through the Nat Turner Project. She earned a BFA from the Pacific Northwest College of Art and is currently based in Portland, OR.